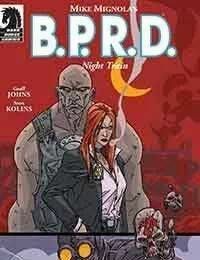 Geoff Johns and Scott Kolins add another project to their list of Hellboy contributions with B.P.R.D. : Night Train! Agents Liz Sherman, whose supernatural talent for starting fires killed her family when she was a teen, and Roger the homunculus, the five-hundred-year-old artificial man who nearly killed Liz by stealing her fire, are sent to investigate a mystery train terrorizing America. This is a train with history. Its last natural journey, some seventy years ago, had a mysterious passenger onboardLobster Johnson, whos still bound to the fate of the locomotive.